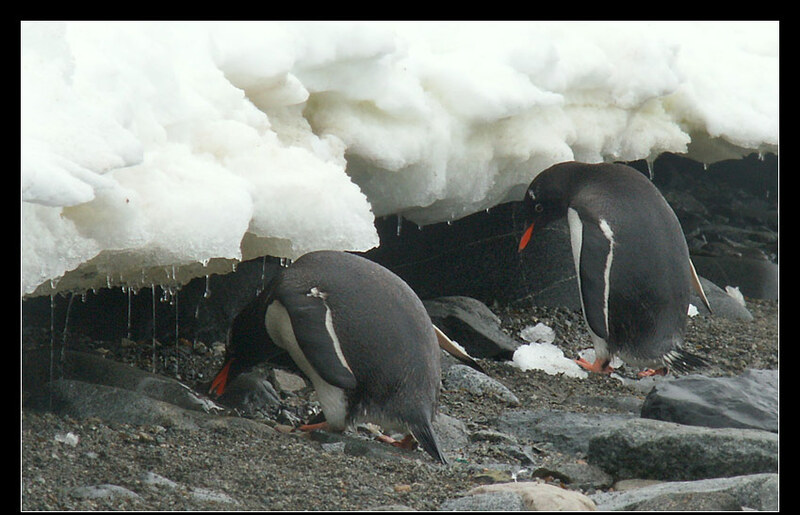 The large adélie penguin colony in the Antarctic summer, is sometimes completely snowed-in and then you can notice some birds eating snow or drinking meltwater. But the snow melts fast and the birds then stand on bare rocks. The ice of the glaciers around is so hard they can't break it with their bill. Sometimes it rains, but this water is so filthy by their droppings, they can't drink it either. And on sea, they only find salt water. How do they prevent for dehydration? Where do they get the necessary water? Do penguins need to drink? A human being excrete salt by the kidneys. Through a complicated system, salt is separated from the blood and transported in the urine. But human nature is not capable to add more than 2,6% salt to the urine and excrete it. That's why we can't drink water of the sea, containing 3,5% salt. Drinking one litre sea water would mean that we had to excrete 1,35 l urine to excrete the salt surplus, meaning a loss of 0,35 l water. Kidneys of birds are build that way too. But many kinds of seabirds live far from freshwater, so there has to be another way to become the necessary drinking. Therefore they developed, during evolution, salt glands, which remove excess salt from their bodies. These organs are modified tear glands that discharge a concentrated solution of sodium chloride through the nostrils. Salt glands enable marine birds to drink seawater with no ill effects. These salt glands are located in the head of a seabird, above the eyes, and connected to the nasopharynx. With the help of these organs, the bird is able to excrete the salt surplus, provided by food and salt water. 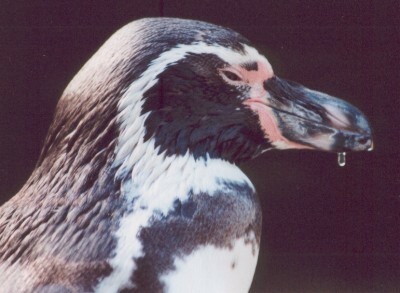 The clear fluid, produced by the salt glands, leaves the body through the nostrils and drops from the top of the bill. That way, the salt glands are able to win 0,3 l freshwater out of the salty sea water. 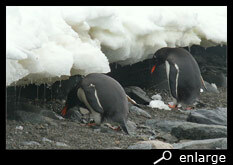 Except when they pant like a dog, penguins are really economical with water. They don't perspire and only excrete uric acid, a white paste-like, poor in water and concentrated waste. They don't urinate like mammals because this would be a waste of water.